Yesterday’s vote for the Security Council seat was really something, wasn’t it? After 10 rounds of voting, neither Guatemala nor Venezuela reached the 2/3rds majority needed to capture the seat, and a third country option looks increasingly likely when the voting restarts at 10 a.m. today. 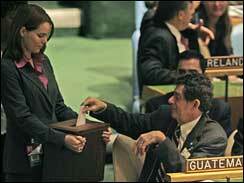 Everyone expected Guatemala to have more support in the early voting due to obscure deals made between member states. There’s nothing exceptional about that: everything at the U.N. is a horse trade. Deals are sometimes struck years before a vote. A country may vow to support Guatemala’s eventual bid for a Security Council seat in exchange for Guatemala’s support for a particular project or vote. Delegates have long memories at the UN. Between each round of voting, you can be sure that the pressure was on to capture “swing” votes. While there were likely negotiations on behalf of Venezuela and the U.S., I imagine that the heaviest push was coming from the contingency planners – those looking to promote a third, less controversial country like Uruguay or Costa Rica. Most delegates have no strong allegence toward either side, and would frankly be relieved to get the voting over with and the vote out of the spotlight. The fact that no third party emerged yesterday is an indication that the base for both sides is pretty strong, which hindered the rise a third-country coalition. Still, most of the arm twisting likely happened after the vote adjourned yesterday evening, so the first couple of rounds of voting this morning will be indicative of where things stand. If a third country receives a good chunk of the vote early on this morning, it’s probably all over for Venezuela and Guatemala. If there are only a few scattered votes for a third country, it means that both Guatemala and Venezuela are holding on to their base and we’ll be in for a protracted battle. If Venezuela sees a spike in support in the early votes, they will push to go all the way. Ditto for an early Guatemala lead. If you have LOTS of time to kill…you can follow the UN vote live on this UN Webcast Page.